Just 5 days after declaring a unilateral ceasefire with the communist rebels in his State of the Nation Address (SONA), President Rodrigo Duterte withdrew his order Saturday evening, July 30. 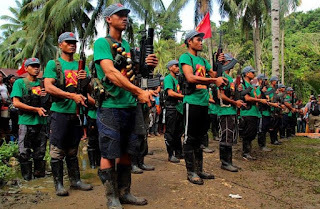 The rebels failed to comply with a 5:00 pm deadline on the same day, to declare a ceasefire as well as give a viable explanation on the ambush of CAFGU members in Davao del Norte. With the Communist Party of Phiilppines (CPP) founder, Jose Maria "Joma" Sison, calling Duterte "volatile" and "asal butangero" (acts like a gangster), the hope of a peaceful resolution to the communist conflict dimmed for a bit. President Duterte should be patient and not expect quick surrenders from highly principled and experienced revolutionaries who have a growing mass base against the rotten ruling system of big compradors and landlords. Sison did not cite any numbers but from a high of around 26,000 fighters in the 1980s, the NPA fighters have dwindled to only about 4,000 today, according to the military. But good news came on Sunday with the CPP statement that they are willing to support peace negotiations with the government in August, despite what happened. The CPP said, "To further support peace negotiations, the CPP is willing to issue unilateral ceasefire declaration separately but simultaneously with the Duterte government on August 20." The government panel will meet with the representatives of the communist rebels for peace negotiations from August 20 to 27 in Oslo, Norway. The government is expected to impose a ceasefire with the rebels when the peace talks start in Norway. It's a good thing that both the government and the communist rebels still want a resumption of peace talks. Too many lives have already been lost in this war of Filipinos against their fellow Filipinos. After almost 50 years of fighting, the only winners in this conflict are the arms dealers and funeral parlors.